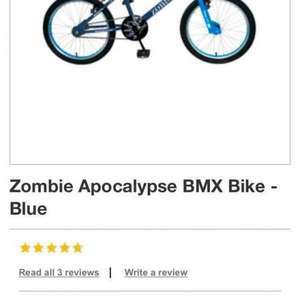 Blue or pink and black zombie 20" Bmx bike. On sale for 37.50 but when bought went down to 35.00 in store only as checked asda online and they were at 70.00! Which asda was this in please? Don't expect: working brakes, a youngster to be able to lift these, or to let it get wet without instantly rusting and please, please don't bring these to my bike shop to try to get them to work properly. If you cannot afford a good bike for your child then consider second hand. They will ride it more frequently and enjoy it much more. Don't expect: working brakes, a youngster to be able to lift these, or to … Don't expect: working brakes, a youngster to be able to lift these, or to let it get wet without instantly rusting and please, please don't bring these to my bike shop to try to get them to work properly. If you cannot afford a good bike for your child then consider second hand. They will ride it more frequently and enjoy it much more. Are you the CEO of Evans Cycles by any chance? According to the specs it weights 85Kgs, a weight limit of 16Kgs and isn't waterproof. According to the specs it weights 85Kgs, a weight limit of 16Kgs and … According to the specs it weights 85Kgs, a weight limit of 16Kgs and isn't waterproof. I really hope they have those numbers the wrong way round, I would struggle to lift 85 kgs and I'm fairly sure that any kid able to sit on the saddle will weigh more than 16 kgs!! Having fell victim to my wife's desire to 'take up cycling' with one of Asda's bikes, I can honestly say I wouldn't touch this with a bargepole. By the way, does anyone want a ladies bike, barely ridden? Deal posting newbie! This is chazcharlene first deal post. Help out by leaving a posting tip or just to show your appreciation for their contribution.